To be eligible for the McCain – Wong Wing Good Fortune Contest, an individual must be a legal resident of Canada and be at least the legal age of majority in his/her province/territory of residence. 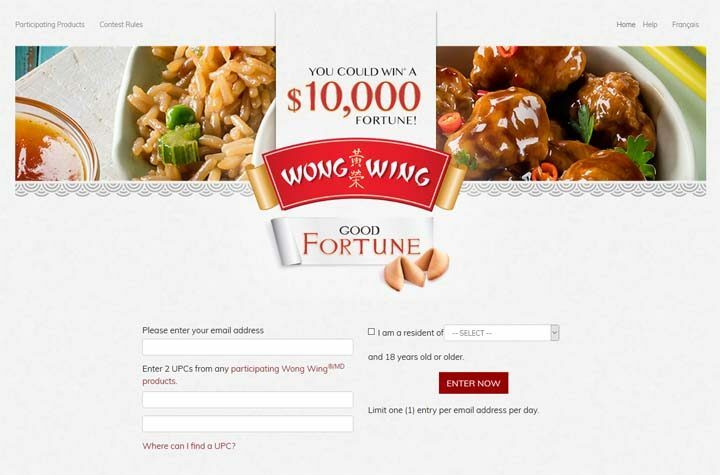 The McCain – Wong Wing Good Fortune Contest ends on November 2 at: 11:59:59PM Eastern ET. To enter to the McCain – Wong Wing Good Fortune Contest, consumers must enter two (2) different UPC codes from participating Wong Wing products at wongwing.ca. Participating products are any 360-680 g WONG WING product or any 426 mL WONG WING Soup. Not valid on $10 Egg Roll or other bulk products, or products exceeding the weight limit as prescribed above. There is a limit of one (1) entry per e-mail address per day. There will be a total of one (1) Grand Prize and 8 weekly prizes to be won. The total value of all Prizes being awarded is $10,800.00.